View of the burial ground at Bangalore. bl.uk > Online Gallery Home	> Online exhibitions	> Asia, Pacific and Africa Collections	> View of the burial ground at Bangalore. 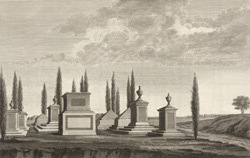 Etching with line-engraving of a view of the burial ground at Bangalore by James Fittler (1758-1835) after sketches Robert Home (1752-1834) had made when he had accompanied the troops in Lord Cornwallis's campaign against Tipu Sultan in 1792. Plate 8 of Robert Home's 'Select Views in Mysore, the country of Tippoo Sultan' published in London in 1794.